This week’s Your News to Know brings you the latest top stories involving finance and the gold market. Stories include: Why one expert believes that gold is the investment with the biggest turnaround potential in 2017, gold could shine in 2017 due to inflation, and gold is getting set to rise higher. About a year ago, MarketWatch contributor Henry To listed three stocks with the biggest turnaround potential in 2016. His prediction was on point, as the three have gone up in price by 21%, 42% and 99%. This year, however, To isn’t making any turnaround picks on the stock market; instead, he’s picking gold as the investment with the biggest turnaround potential in 2017. One of the chief reasons for this prediction are U.S. and Chinese inflationary policies, in particular, Donald Trump’s tax-cutting plan which would add an estimated $7.2 trillion to the federal debt within a decade. This would be on top of the current outstanding debt of over $19 trillion. Plus, with China’s housing bubble threatening to burst, Chinese speculators are turning to commodities such as metals. Over the past three months, zinc and copper prices have already seen a 20% and 25% increase, respectively, due to Chinese buyers, and the recent gold futures turnover in China suggests that the pricing power of precious metals is increasingly shifting towards Chinese hedge funds and traders. To also expects the recovery in jewelry demand to play an important role in gold’s climb. Jewelry demand in China and India has experienced unprecedented weakness, yet To notes that the circumstances behind the fall in demand – a loss of Chinese consumer confidence, import restrictions in both countries and a cash crisis in India – will not repeat themselves in 2017. And with the large Hong Kong-based retailer Wo Shing Goldsmith reporting a 20%-25% rise in gold jewelry sales over the past month, it seems that To’s predictions are already starting to come true. In his recent piece on Forbes, analyst Frank Holmes, like many others, points out that Trump’s policies are looking more inflationary by the hour. Holmes invokes the recent image of Turkish President Recep Erdogan urging his citizens to convert their foreign exchange into either gold or the Turkish currency as an example of how to protect against inflation. In the U.S., Holmes believes that inflation will be of a different variety, caused by rising production costs. While Trump’s efforts to bring jobs back are commendable, they are also starting to increase production costs across the board. Holmes worries that the recent Carrier deal, which forced the air conditioner manufacturer to raise prices by 5%, is a potential omen for the kind of inflation not seen in the U.S. for over 30 years. Furthermore, Trump’s plan to restrict the importing of cheaper goods is the kind of inflationary pressure that could result in a deeper negative real rate environment – which can ultimately be good for gold. Holmes predicts that central banks will be among the top buyers of gold as a hedge against inflation, just as they have been in the past. 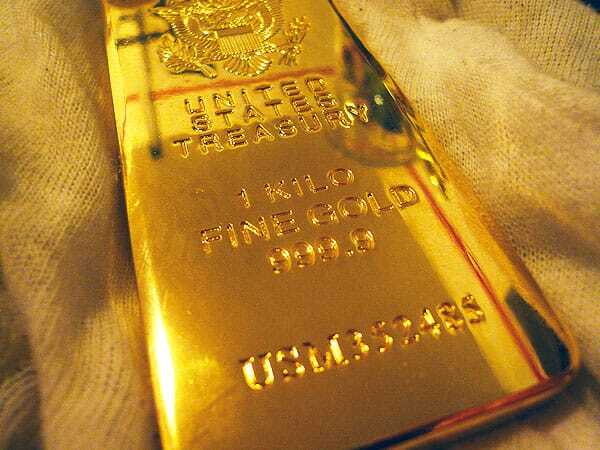 Swiss bank Credit Suisse agrees; a recent report from the bank states that potential U.S. budget deficits and debt risking dollar strength could spur central banks around the globe to increase their gold holdings. Stelios Konto from Business Insider recently presented an interesting argument backed by solid facts: central banks want to exchange as much of their paper money as possible for gold bullion. Konto notes that any central bank that buys too much gold too soon would not be a good look for its monetary policy, not to mention that massive government buying would increase the metal’s price and therefore make mass acquisition more difficult. Yet central banks don’t have to work too hard to implement a system that supports their “gold-buying program”. Using derivative gold products, they can push prices lower with their fiat currency before using that same currency to buy bullion at a bargain. As Konto explains, central banks are more than happy to buy the gold from frustrated citizens after having artificially deflated its price. Another example of why derivatives are problematic is the demand for physical gold has been steadily increasing for the past 5 years despite the metal’s price drops. The COMEX situation is a perfect example of this: with the trading market reaching a 1:500 ratio of physical to paper gold, it would only take a couple of demands for physical delivery for the whole system to come crashing down. Central banks are fully aware of the very thing that they have been vehemently denying: gold is an extremely important resource and potentially the most reliable store of value. They know that gold is a finite resource that is difficult to produce while fiat money is made by pressing a button. With this in mind, Konto isn’t too worried about the markets already pricing in another hike – all he sees is a very good long entry point. For him, the fundamentals and the big macro picture all point towards one thing: gold is in a long consolidation phase and coiling for the next big leg higher.